Enclosure No 10 Proclamation of Martial Law from and after 12 o'clock on Wednesday 6th December 1854: "I proclaimed that Martial Law should be administered within the District of Buninyog comprising Ballarat and its immediate neighbourhood". Enclosure No 13 Revocation of Martial Law from 9th December 1854: "I, with the advice of my Executive Council repealed Martial Law and therefore it had only an existence of three days". THE following notices were issued by the Executive yesterday afternoon, intimating the proclamation of Martial Law at the Gold- fields of Ballaarat, to commence tomorrow, the 6th inst. By His Excellency Sir Charles Hotham, Knight Commander of the Most Honorable Military Order of the Bath, Lieutenant Governor of the Colony of Victoria etc., etc., etc. WHEREAS large bodies of Armed Men have arrayed themselves against Her Majesty's FORCES and the constituted authorities, and have committed acts of open rebellion: And whereas for the effectual suppression thereof it is imperatively necessary that Martial Law should be administered and executed within the limits hereinafter described: Now I, the Lieutenant-Governor of the said colony, with the advice of the Executive Council thereof do hereby command and proclaim that Martial Law from after Twelve of the Clock at noon on Wednesday, the sixth day of December instant, shall and may be administered and executed against every person and persons within the said limits who shall at any time after the said hour commit any act of rebellion, any treason, treasonable or seditious practices, or other outrage or misdemeanour what so ever within the following limits, that is to say: Commencing at the junction of the Yarrowee River and Williamson's Creek, thence by a straight line to the junction of the Lal Lal Rivulet with the Moorabool River; thence by that river to its source in the great Dividing Range: thence by that range to the boundary of the County of Ripon, and by that boundary south-westerly to the township of Carngham, at Bailie' s Creek; thence by a line south-easterly to the junction of the River Yarrowee with Williamson' s Creek aforesaid: And I do hereby, with the advice aforesaid, order and authorize all officers commanding Her Majesty's Forces to employ them with the utmost vigour and decision for the immediate suppression of the said rebellion and offences, and to proceed against and punish every person and persons acting, aiding, or in any manner assisting in the said rebellion and offences, according to Martial Law, as to them shall seem expedient for the punishment of all such persons: And I do hereby especially declare and proclaim, that no sentence of death shall be carried into execution against any such person without my express consent thereto; and I do hereby, with the advice aforesaid, notify this my proclamation to all subjects of Her Majesty in the Colony of Victoria. Given under my hand and Seal of the Colony, at Melbourne, this fourth day of December, in the year of our Lord one thousand eight hundred and fifty-four, and in the eighteenth year of Her Majesty's reign. (L.S.) CHAS HOTHAM by His Excellency's Command, JOHN FOSTER God save the Queen. Enclosure No 13 in Duplicate Despatch No 162 of the 20 Dec 1854 VICTORIA GOVERNMENT GAZETTE EXTRAORDINARY Published by Authority No.113 WEDNESDAY, DECEMBER 6. 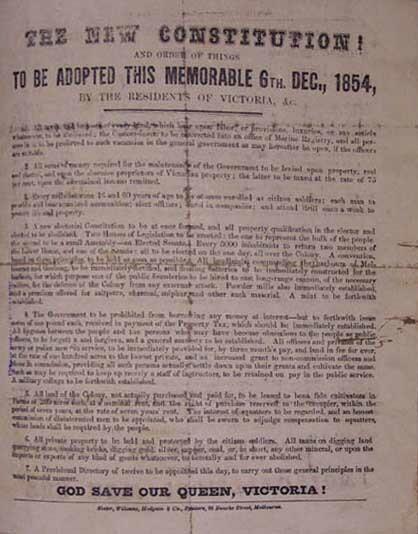 1854 MARTIAL LAW IN THE BUNINYONG DISTRICT REVOKED FROM 9TH DECEMBER PROCLAMATION By His Excellency SIR CHARLES HOTHAM, Knight Commander of the Most Honorable Military Order of the Bath, Lieutenant Governor of the Colony of Victoria, &c., &c., &c. WHEREAS by a Proclamation under the Hand of the Lieutenant Governor of the Colony of Victoria, and under the seal of the said Colony bearing date the Fourth day of December, A.D. 1854, reciting amongst other things that Bodies of Armed Men had arrayed themselves against Her Majesty’s Forces and the Constituted Authorities, and had committed acts of open rebellion, it was commanded and proclaimed that from and after Twelve of the clock at Noon on Wednesday, the Sixth day of the said month of December, Martial Law should and might be administered and executed against every person and persons within the limits thereinafter described, and which limits included the Gold Fields of Ballaarat, who should at any time after the said hour commit any act of rebellion, any treason, any treasonable or seditious practices or other outrage or misdemeanour whatever within the said limits. And whereas information has been received from the General Officer Commanding Her Majesty’s Forces within the said limits that the population engaged on the said Gold Fields have returned to their usual avocations, and the commission of the said offences having been suppressed, it is therefore expedient that the said recited Proclamation should, from the time hereinafter mentioned, be revoked. Now I, the Lieutenant Governor of the said Colony, with the advice of the Executive Council thereof, do hereby declare and proclaim that from and after the hour of Twelve of the Clock at Noon on Saturday, the Ninth day of December, now instant, the said recited Proclamation shall be, and the same is hereby revoked; And I do hereby, with the advice aforesaid, notify this my Proclamation to all subjects of Her Majesty in the said Colony of Victoria. Given under my Hand and the Seal of the Colony, at Melbourne, this Sixth day of December, in the year of Our Lord One thousand eight hundred and fifty-four, and in the eighteenth year of Her Majesty’s Reign. (L.S) CHAs. HOTHAM By His Excellency’s Command, JOHN FOSTER GOD SAVE THE QUEEN! This page was last edited on 14 April 2019, at 05:32.